iTunes Music Store provides lots of online music for users to purchase while with a restriction that the music purchased can be played on Apple devices only. So to a certain extent, it limits us to use the music we have bought. How on earth does Apple make this limitation? First of all, we should know a term "DRM" which is short for Digital rights management. DRM is an advanced access control technology with the purpose of limitting the use of digital content after sale. Due with the use of this technology, the music we downloaded from iTunes store is DRM copy-protected. However, we long to use purchased music freely as we like. Is there any solution? The purchased iTunes music can’t be played on other devices is because these devices can’t recognize the audio format. As you know, MP3 is a common and widely used format. Almost all of music players support MP3 format. So if we convert iTunes music to MP3, the problem is solved. We are very eager to have such a software to help relieve troubles this problem bring to us. 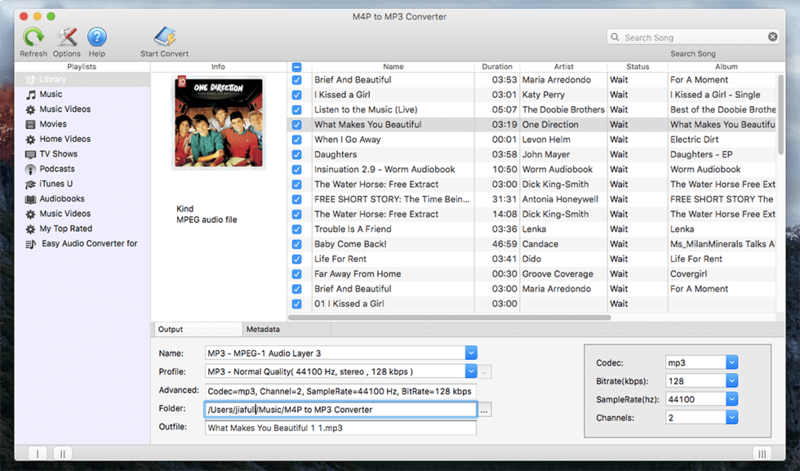 Well, M4P to MP3 Converter for Mac is a perfect solution. This software can just perfectly solve your problem. 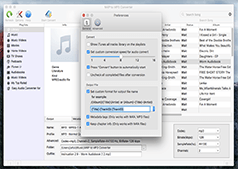 This application removes DRM-protection from purchased iTunes music so that it can easily convert iTunes music to regular audio formats like MP3, AAC, M4A, M4R, MKA, AIFF, and etc. After convertion, you can listen to your music on any device such as iPad, iPhone, Archos, HTC, BlackBerry, tablets, smartphones, Walkman, and car MP3 CD players, etc. It offers an user friendly and intuitive interface. 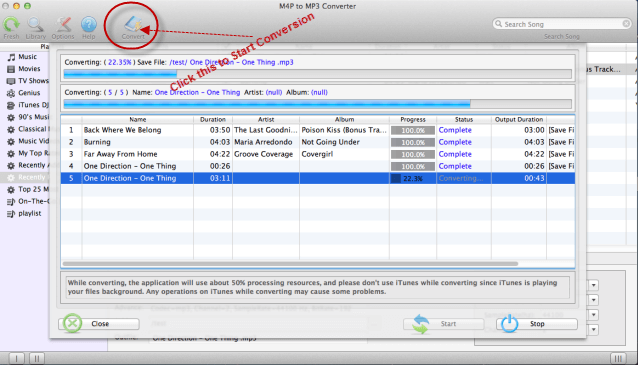 You can use it to convert purchased iTunes music with several steps. 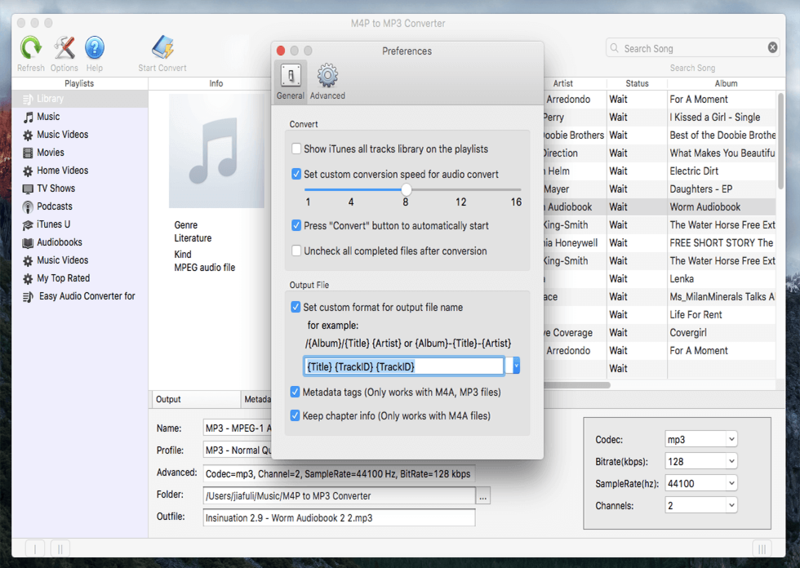 The following guide demonstrates how to convert purchased iTunes music to MP3 or other formats on Mac OS X without any restrictions or DRM protection. Step 1. 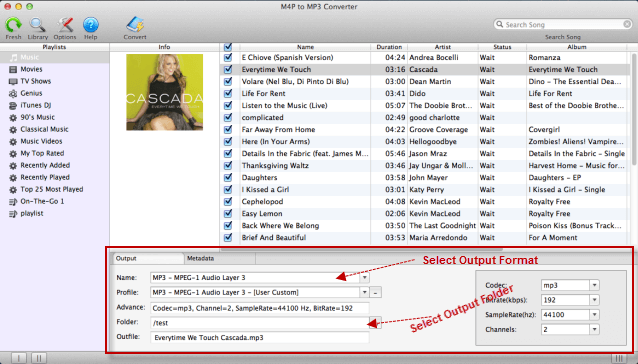 Launch M4P to MP3 Converter for Mac. Once the program started normally, the Apple itunes will be lauched automatically at the same time. Step 2. Click the relevant Playlists category and select one or more iTunes music you want to convert. It is also available to choose the whole list by selecting the check box at the top of the list. Also you can easily find any music you want using the Search function in the upper right corner. Step 3. Make output seetings. Choose an output format and set the destination folder you want to save your output files in. The profile settings will be adjusted automatically according to the chosen output format. You can also set your own output parameters. Click the "Convert" button and begin to convert purchased iTunes music on Mac. Wait for converting and when it finished, the music you wanted will present to you well. Done, Now you can play your converted iTunes music anywhere, anytime with no problem at all. 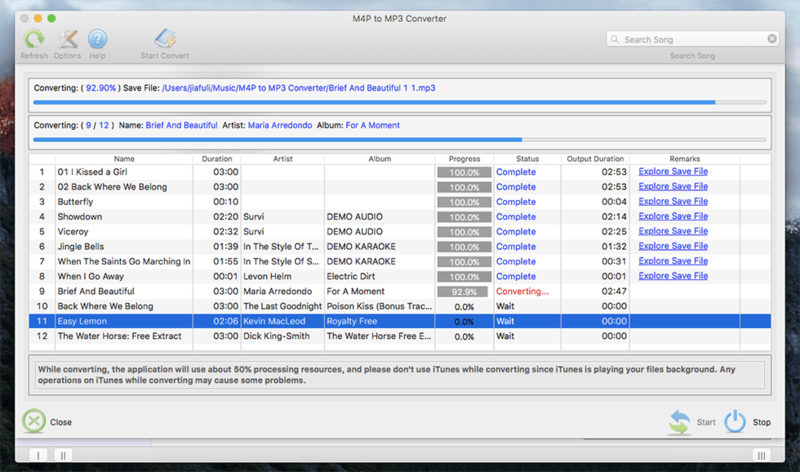 If you purchased more music from iTunes — let M4P to MP3 Converter be your assistant.